This was the day I have been preparing myself for mentally for last few months. 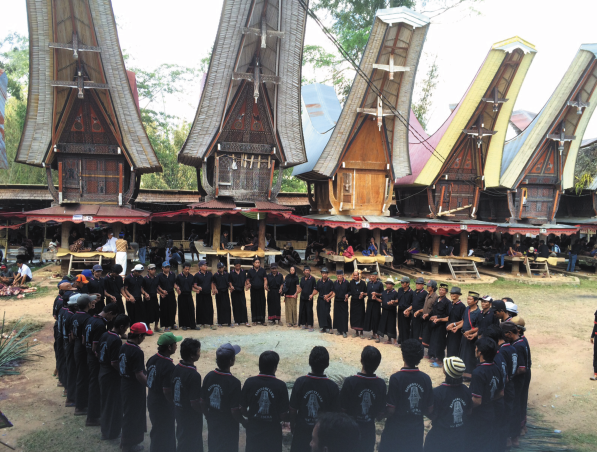 Toraja land and Toraja people is the place where traditions survive the onslaught of „modern“ era. And this was the main reason we came here: To see them, and let’s be honest, it was not always easy to watch. I have to say that we have for our stay in Toraja land an excellent local guide with a comfortable car and driver. Otto, the guide, was carefully selected by mom, and she did a great job in getting somebody to learn more and understand as much as possible. Because what we can see here is so unusual we can hardly find anywhere else. If I thought the visits of the local markets may have prepared me for what we saw today I was a little bit too optimistic. 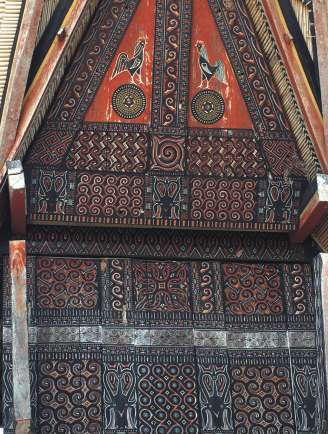 Toraja people, similarly to many small entities (Jews, Koreans to mention just a few), in their quest of cultural survival, hold to their family and clan structure through sticking to their customs and traditions no matter how bizarre they may be for outsiders. And here I am stunned (mom was much better prepared) thrown into the middle of one of the most important Toraja festivities. The celebration of one of the clan elders who actually passed away 2 years ago, but was kept embalmed at home. Now the process of healing of his immediate family with his departure has come to an end. Now he can be buried, nobody cries anymore and let us throw a party. And what a party it was! The clan’s plaza surrounded by their traditional houses which serve as granaries or their residential homes, is a place where clan hosts thousands of members from the village as well as the faraway places of Toraja land. They meet and throughout the party they talk and strengthen the clan member relationship. All of them in black outfits they execute this idea in a rather gruesome manner. 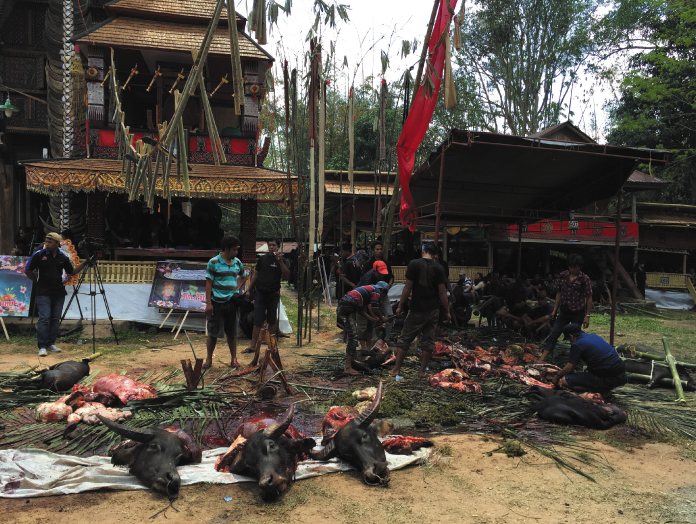 What can be described very gently as sacrifice (as in many religion is) here in Toraja land it is a merciless slaughter of a hundred of pigs and a little bit less of buffaloes. 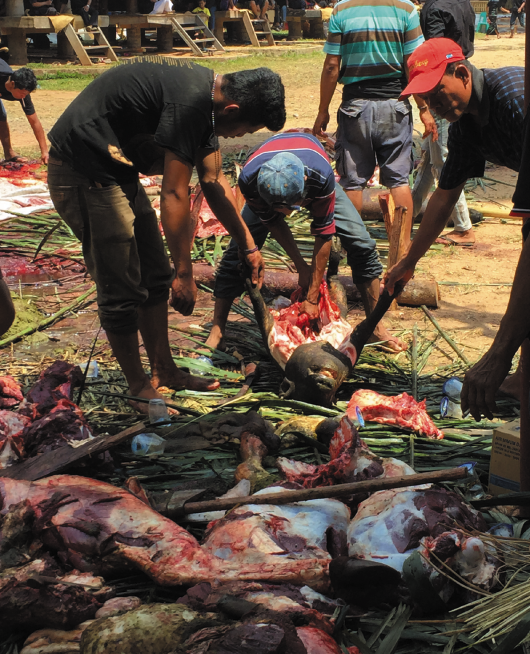 Being a descendant of the village butcher’s family, my grandfather and uncle of maternal lineage where members of this profession, I saw some of this trade when growing up in my land of ancestors. But I was unprepared for this. To my surprise mom clearly was! For me it was a strange contrast of the beautiful architecture of the granaries and casual cruelty of this massacre as I would see it. I had a hard time to keep my composure as I was trying to document the artistry of the traditional granaries while kicking over the animals waiting to be paraded in the procession in front of the casket followed by their last moment of life. Regarding buffaloes they seem approaching their fate with resignation and in peace. Maybe they understood their significance of being a vehicle for varying the souls to the Land of Ancestors. But pigs? They must be smart cookies and they knew pretty well what is coming and let their executioners know about it. Loudly. No matter how hopeless their resistance was. They screamed. They kicked. They breath heavily as their end was approaching. No matter how much I admire Toraja people for their stubbornness to define their own destiny and their eternal love for pork bacon. And how much I hate Moslem owners of the hotels we stayed in other parts of this country to impose their „beef bacon“ culture on me, this was simply too much for me. Never ever in my life I was closer to the idea to give up on prosciutto and become a VEGETARIAN!!! As an anticlimax to this bloodthirsty morning we visited a place where the body, soul, spirit and phantom of the deceased are put to their final rest. 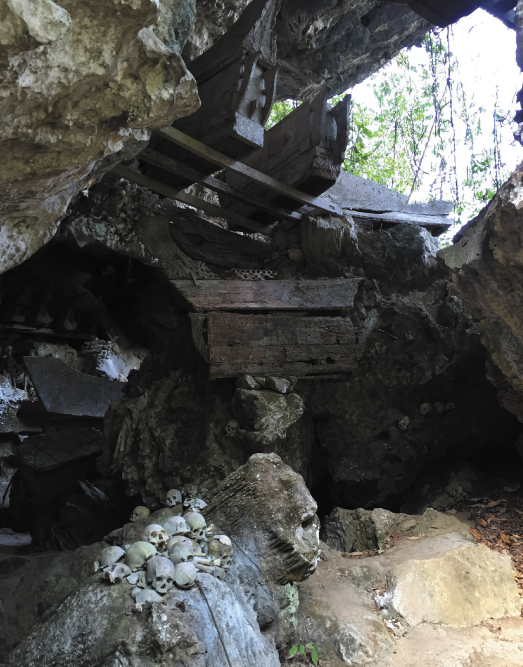 Toraja people do not bury their ancestor under ground. The soil is too valuable here and the place of the final rest can not disturb the life giving force with death. Instead they transfer them to the caves where their descendants can still visit them and be with them. To my own surprise I did enjoy this calm and kind moment of the day tremendously as my intention to convert to vegetarianism weakened with more urgent ideas for upcoming dinner. At the end of this story I would like to state that I was very careful in selection of photos to show only those you may feel comfortable with.